When researching a lot of the Classic European Sports Bikes that end up on the shores of The United States, one truth keeps showing up. That truth is that large US importers were the ones who directed the European manufactures on the bikes that they would develop and put into production. This High Cam Parilla Grand Sport is another such “request”. 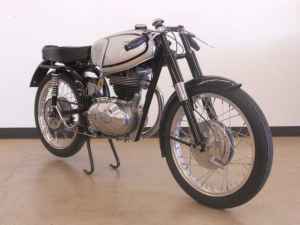 Parilla was a small Italian company who’s founder,Giovanni Parrilla, was inspired by the dominant Norton Manx and purchased one to study. A short time later he went racing with his own design. Through the late ’40 and early ’50s Parrilla’s design evolved into High Cam engine. 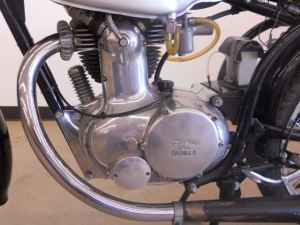 First introduced in 1953 the High Cam started out with about 22hp and would be continually developed until Parilla closed their doors in 1963. 1957 Parilla 175 Grand Sport. This was the ultimate race bike of its’ day. 175cc High Cam Engine with Gear Driven Cams, High Revving and High Compression. 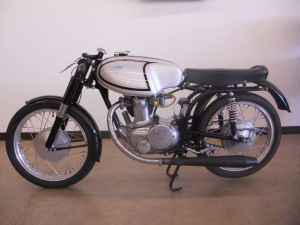 This extremely rare motorcycle is completely restored as a race bike. It has no miles on it since its’ complete restoration. It has all of its’ original parts and has matching numbers on the engine and frame, making it very rare. It also has a title from California and could be easily retitled in any state. The price is $12,500. 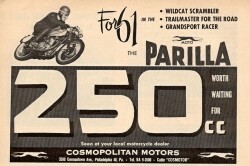 Cosmo appears to have been the number one importer for Parilla and appears to have also supported many racers. They had requested a larger displacement bike, and in turn Parilla add 25cc to the first Grand Sports and increased output to 26hp and a top speed of 100mph. This example also has the high cam driven by gears, and improvement over the original chain. 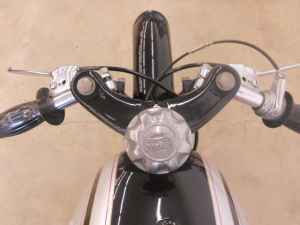 Cosmo offered an Alloy barrels that would allow you to punch the engine out to 250cc. When ever I dream about owning a Classic Bike that seems to be rarer then you standard Classic I always wonder what kind of parts hell I could be entering. 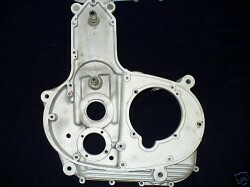 Doing a quick search on eBay, I found this engine case and crank with a starting bid at $900+. Compared to the $200 you can find Triumph cases for or $600 for a /2 BMW, I can see that that owning this bike would be enjoyable, but expensive.